BRANDS, E.A.M. (Eugène) (1913-2002). 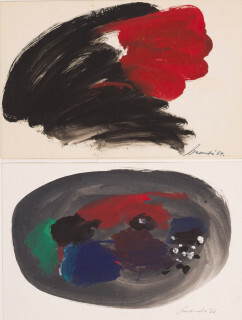 Lot of 2 GOUACHES on paper (both abstract compositions, one titled ““grijs ovaal” (gouache)” in blue ink on verso). BRANDS, E.A.M. (Eugène) (1913-2002). 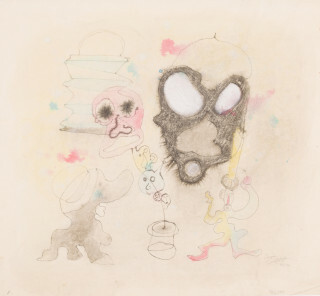 (Surrealistic composition with figures & masks). DRAWING in black ink (finished with watercolour) on paper. 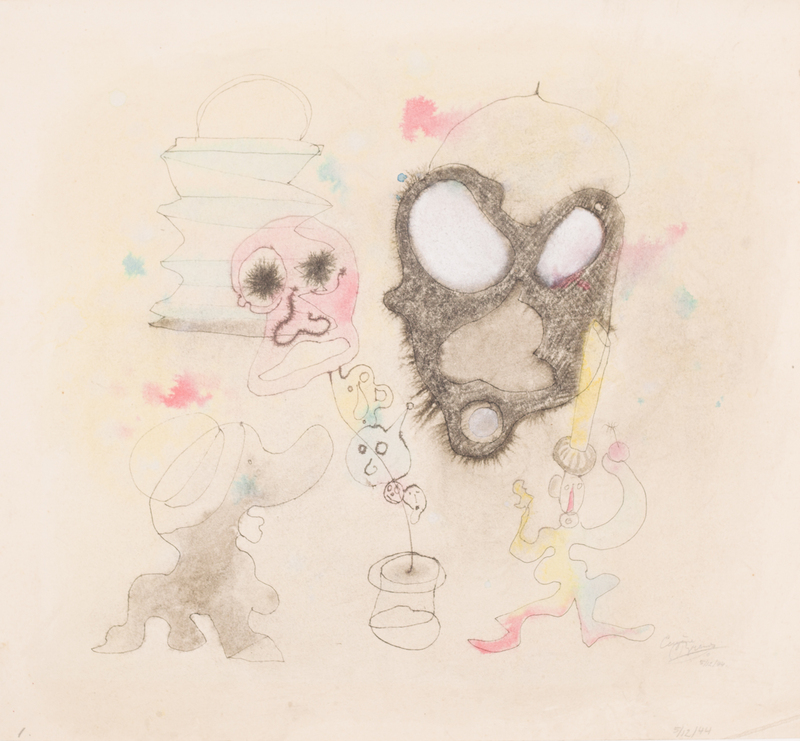 Signed “Eugène Brands” & dated twice “5/12/44” in pencil in lower right corner. Ca. 29 x 32 cm. BRESDIN, R. (Rodolphe) (1822-1885). (The Adoration of the Magi). Etching. Ca. 4,3 x 8,1 cm. Tipped onto a paper mount. CAMBIASO, Luca (1527-1585) (circle of). “Arethusa”. Late 16th-cent. drawing in brown ink (& wash) on paper. Titled in brown ink in lower blank margin. Ca. 28,5 x 12,5 cm. 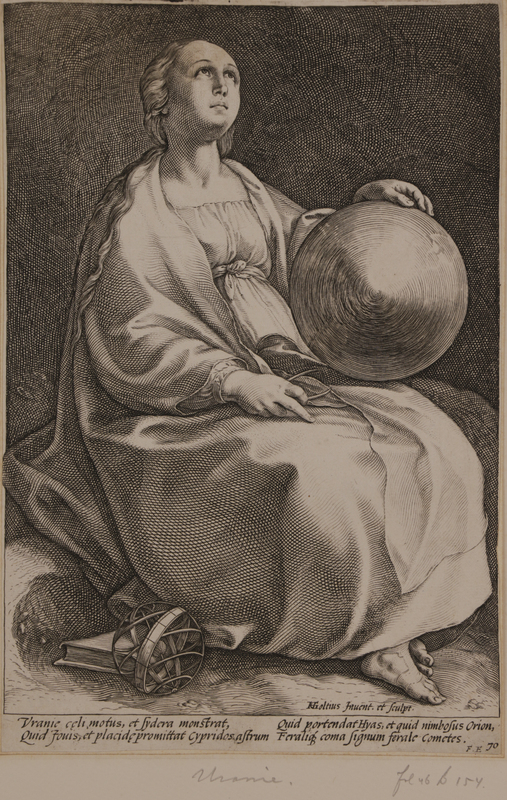 GOLTZIUS, H. (Hendrick) (1558-1617). 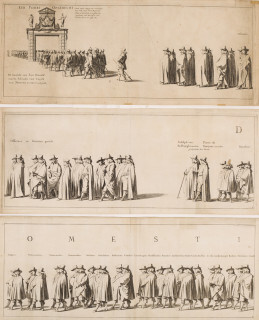 Collection of 5 engravings from the series “The Nine Muses” (printed after 1592). [HOUSE OF ORANGE] – [NOLPE, Pieter (ca. 1613-ca. 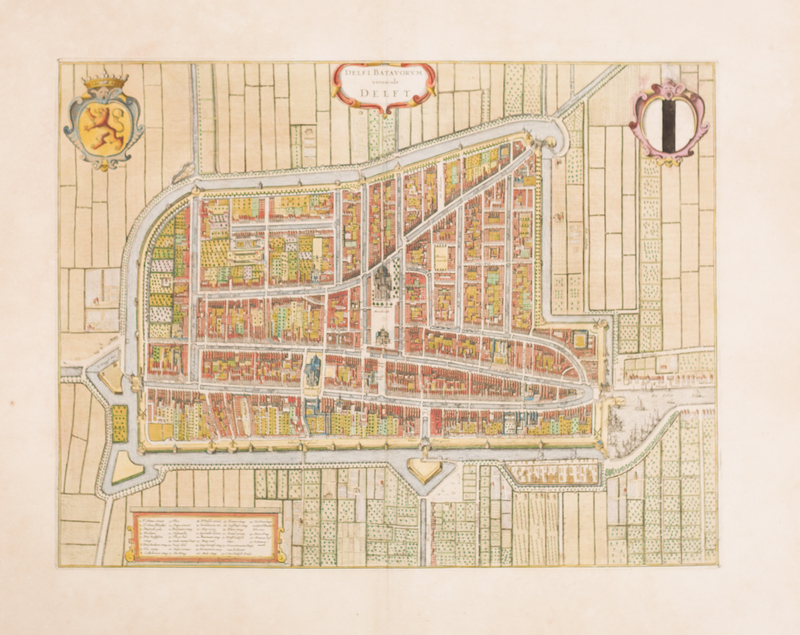 1653). “Begraeffenisse van Syne Hoogheyt Frederick Henrick, by der Gratien Gods Prince van Orange, Grave van Nassau [..]”]. [HOUSE OF ORANGE] – “VERMEERDERING. Wilhem Hendrik by der Gratien Godts Prince van Oraenjen en van Nassau, [..]. Vermeerdering. 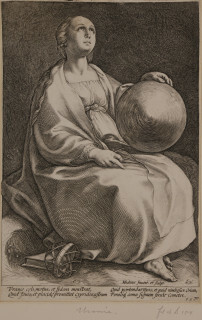 Maria Stuart, oudste Dochter van Iacobus, Hartog van Iorck, [..]”. 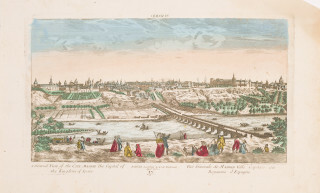 LE MIRE, Noël (1724-1801). “Plafond de la Salle de Spectacle de Bordeaux, Inventé et peint par J. Robin, Gravé par N. le Mire [..]”. 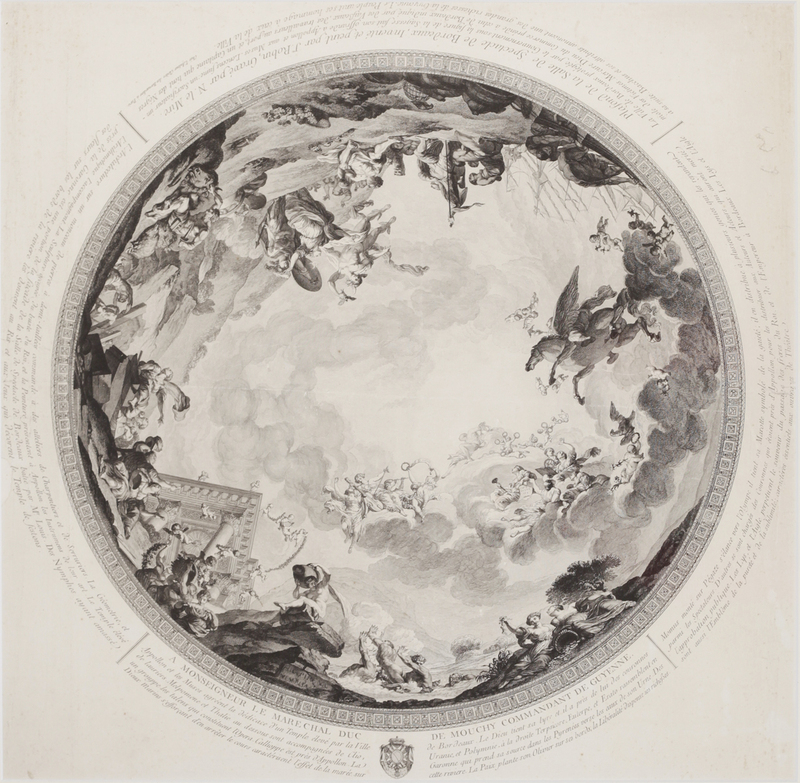 Large-sized circular engraving (diameter ca. 56 cm.) surrounded by 4 French captions (incl. 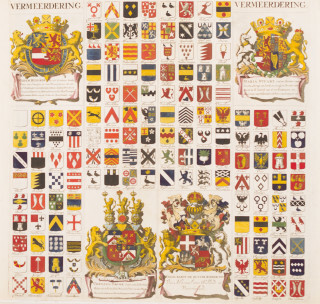 a coat-of-arms). Publ. by N. Le Mire (Paris, ca. 1782). Ca. 64 x 64 cm. (leaf). Behind passepartout & framed (behind glass). RADEMAKER, A. (circle of). 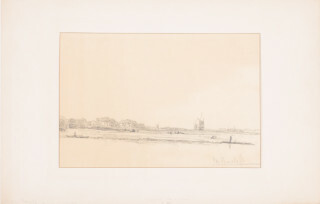 (View of a river with profile view of a town in the background). Late 17th-/ early 18th-cent. DRAWING in brown & grey ink (finished with watercolour) on paper. Ca. 11 x 22,5 cm. Tipped onto a mount & framed (behind glass). RÄDECKER, M. (Max) (1914-1987). “Poires”. GOUACHE on paper. 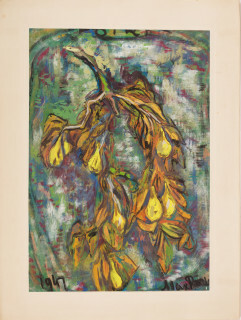 Titled at top, dated “1947” & signed “Max Räde[cker]” in lower part. Ca. 60 x 41,5 cm. Tipped onto a paper mount. RICCI, Marco (1676-1730) (circle of). 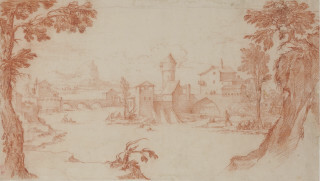 (View of an Italianate river-landscape with a bridge & walled city in the foreground). 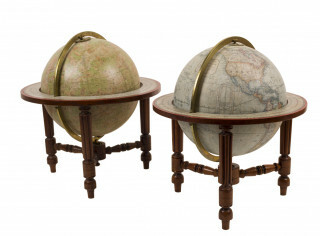 Late 17th-/ early 18th-cent. 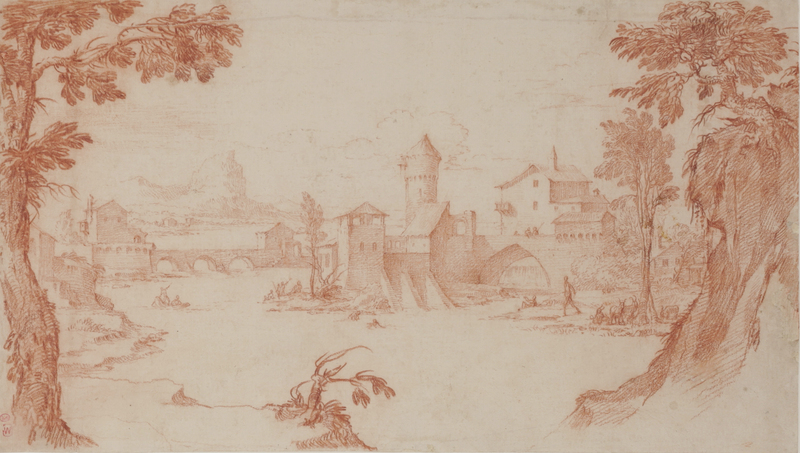 DRAWING in reddish-brown chalk on paper. Ca. 22,5 x 39,5 cm. Behind passepartout & framed (behind glass). 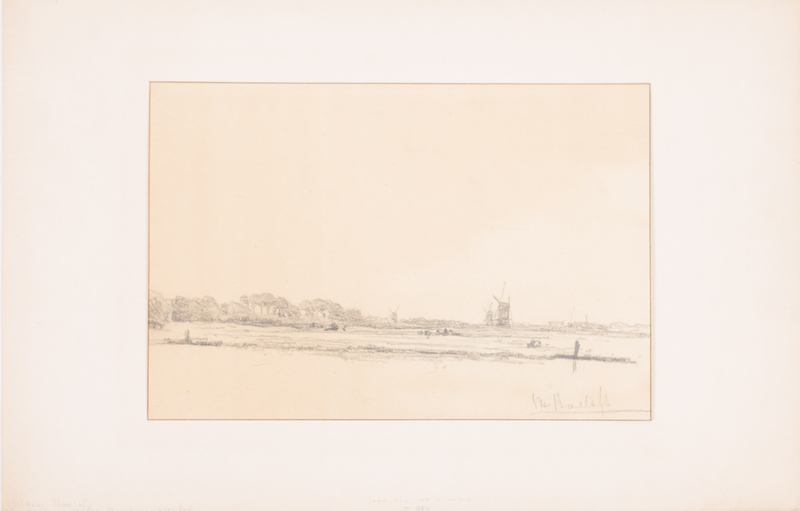 ROELOFS, W. (Willem) (1822-1897). (View of a Dutch landscape with 3 wind-mills in the background). [STUDENTICA] – HORA SICCAMA, Louis Charles (1807-1880). 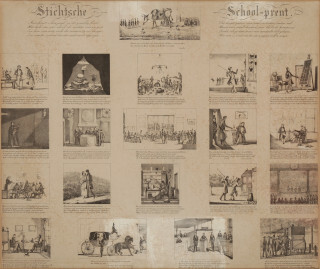 “Stichtsche School-prent [..]”. 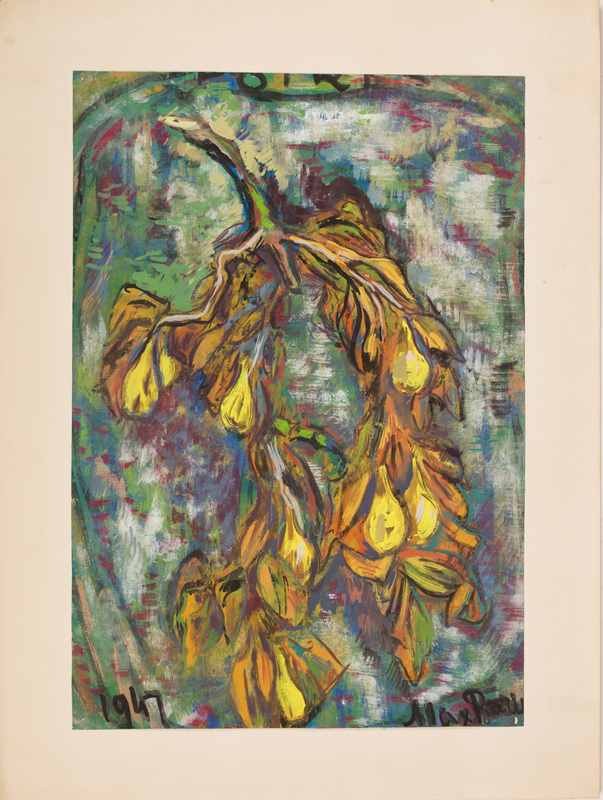 Lithograph dep. 20 ills. (meas. mainly ca. 5,5 x 6,5 cm.) nearly all with Dutch verses in 4 lines below. 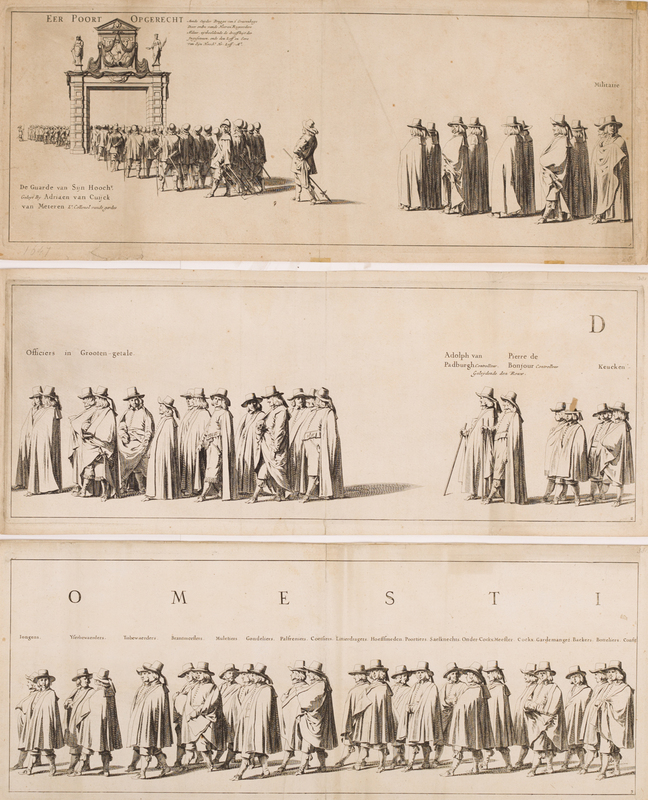 (Printed in Amsterdam by “Desguerrois en Co.”, ca. 1835). Ca. 38 x 45 cm. (leaf). Behind passepartout & framed (behind glass). COLLECTION of 5 miscellaneous 17th-/ 18th-cent. engr. views. [ETHIOPIA] – “LANDKAART VAN ABYSSINIE, door James Bruce”. Handcol. engr. 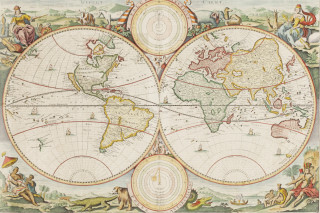 map with 4 small inset maps by J. van Jagen after J. Bruce. (Publ. 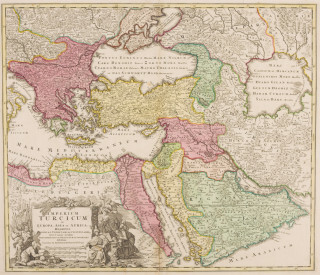 in 1794). Ca. 45 x 42,5 cm. 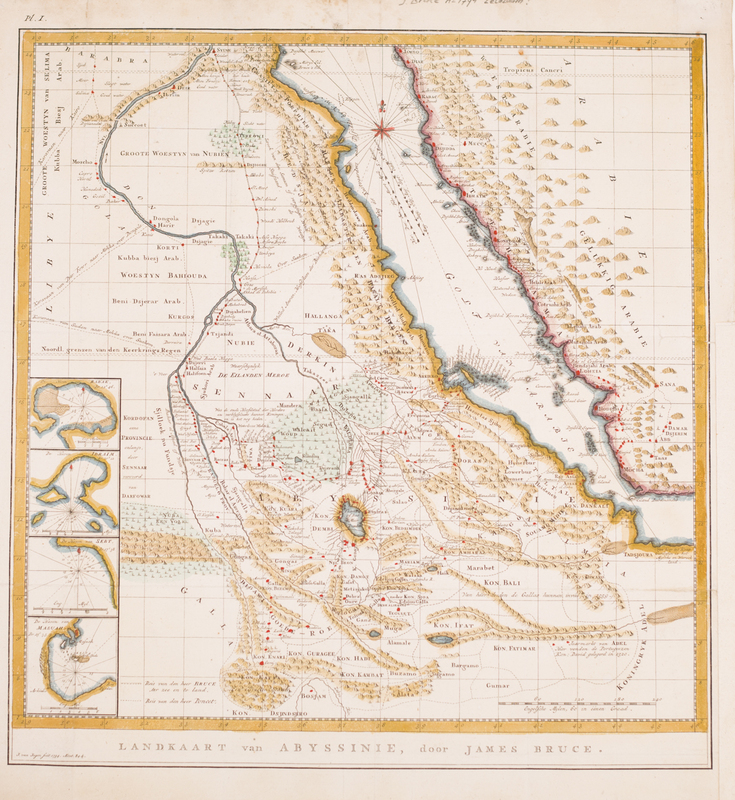 [MOROCCO] – “FEZZAE ET MAROCCHI REGNA AFRICAE [..]”. Handcol. engr. 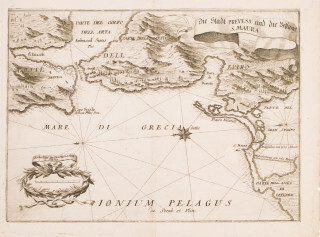 map with cartouche after A. Ortelius. (Publ. by J. Janssonius, ca. 1650). Ca. 38 x 49,5 cm. [OPTICAL VIEWS] – “A GENERAL VIEW of the City Madrid the Capital of the Kingdom of Spain [..]”. 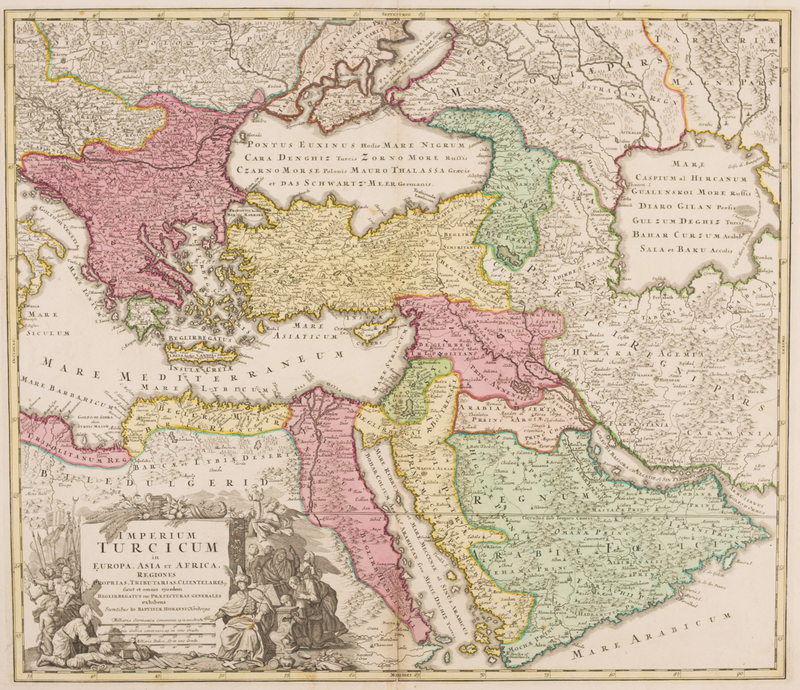 [TURKEY] – “IMPERIUM TURCICUM in Europa, Asia et Africa, [..]”. Contemp. handcol. engr. 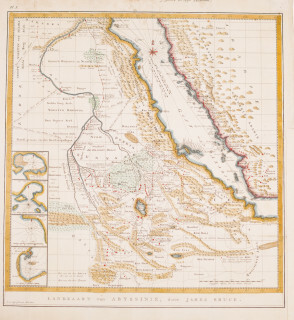 map with cartouche by J.C. Steinberger. Publ. by J.B. Homann (Nürnberg, after 1720). Ca. 48,5 x 56 cm. 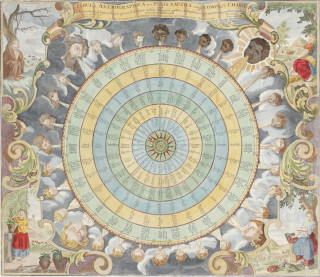 [WIND-CHART] – “TABULA ANEMOGRAPHICA seu Pyxis Nautica, vulgo Compass. Charte quâ Ventorum Noia septem linguis graeca scil. 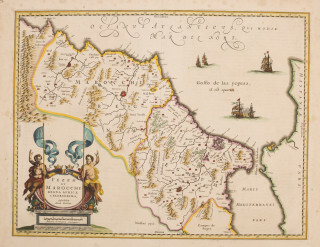 latina, italica, hispanica, gallica, hollandica et germanica repraesentantur [..]”. Handcol. engr. wind-chart with cartouche dep. 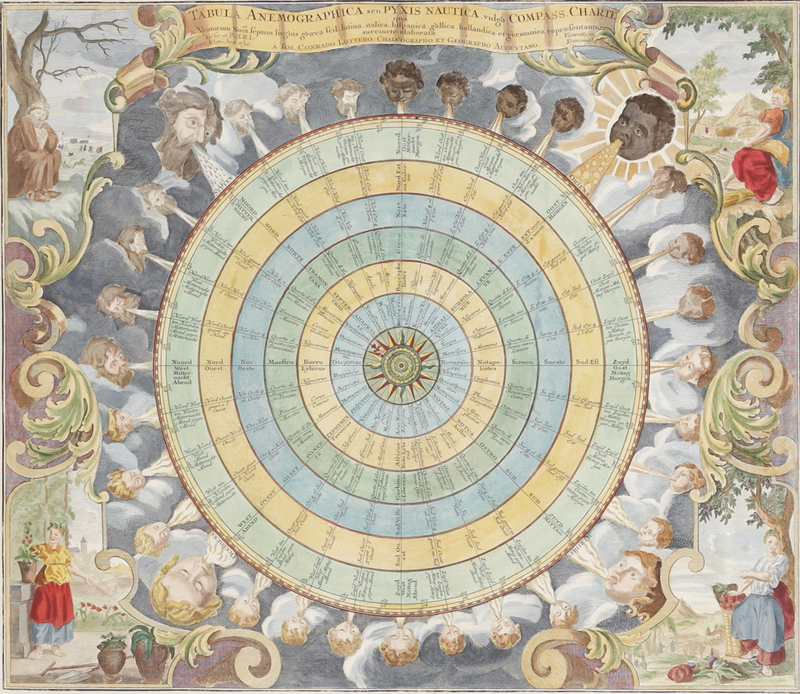 6 concentric circles with a compass-rose in the middle (divided in 32 sections pointing to 32 male wind-heads) with the main winds in 7 different languages & decorated with 4 allegorical figures in the corners (representing the 4 seasons). Publ. by T.C. Lotter (Augsburg, ca. 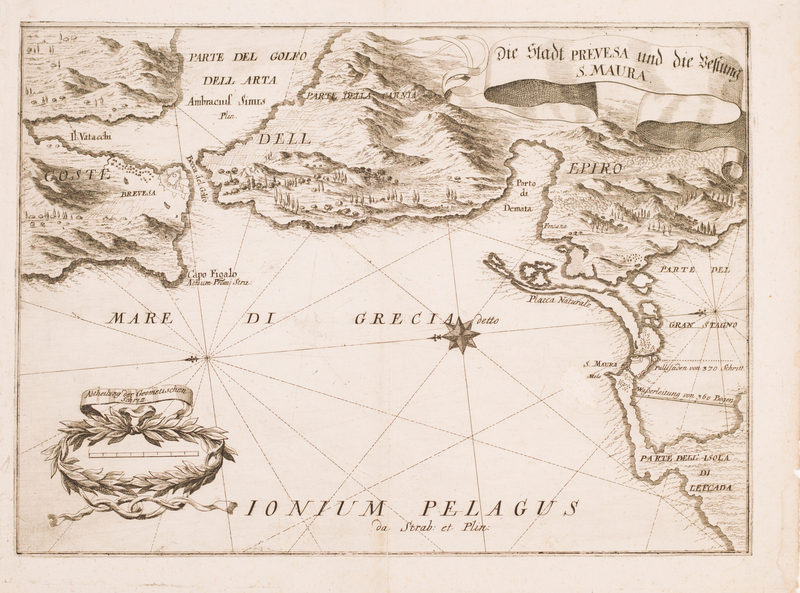 1760). Ca. 50 x 58,5 cm. Behind passepartout & framed (behind glass). Handcol. engr. 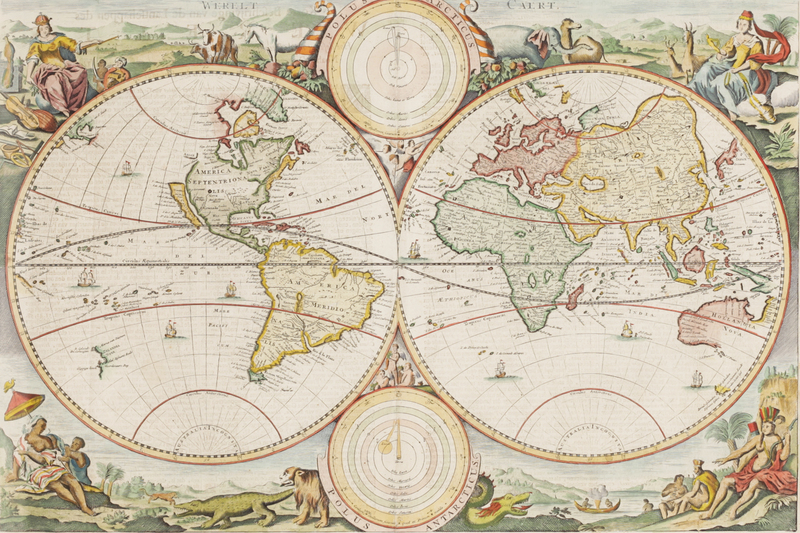 world-map (in 2 hemispheres) with 2 small inset polar hemispheres (“Polus Arcticus” & “Polus Antarcticus”) & 4 allegorical figures in the corners (representing the 4 continents). (Publ. in a Dutch “Keur-Bijbel”, after 1704). Ca. 31 x 46 cm. Behind passepartout & framed (behind glass). 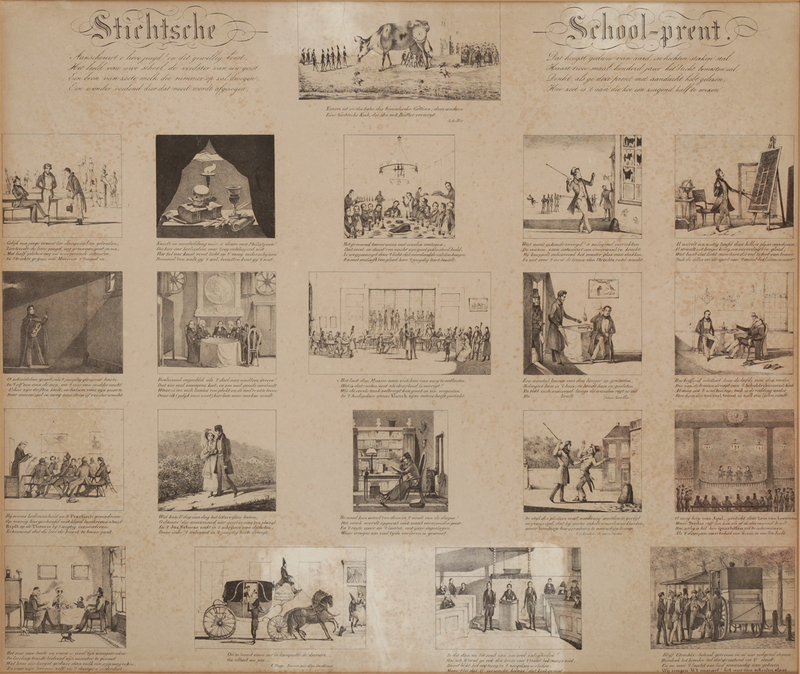 [AMSTERDAM] – SCHULTSZ, J.C. (Johan Christoffel) (1749-1812). “Plechtige Optocht door de Werklieden van de Admi-raliteits Scheeps Timmer Werf binnen Amsteldam. 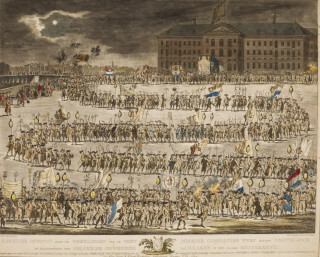 By Gelegenheid der Gelukkige Omwending van Zaaken in den Jaare 1787 [..]”. 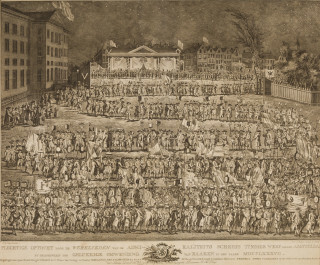 Large-sized engraving with Dutch caption (incl. a coat-of-arms). Publ. by J.H. Trop (Amsterdam, ca. 1787). Ca. 52 x 63 cm. Behind passepartout. 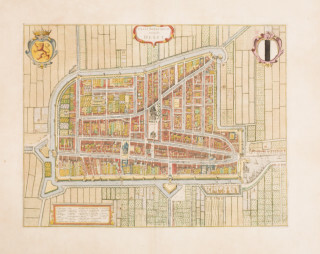 [AMSTERDAM] – SCHULTSZ, J.C. (Johan Christoffel) (1749-1812). “Plechtige Optocht door de Werklieden van de Oost Indische Compagnies Werf binnen Amsteldam. 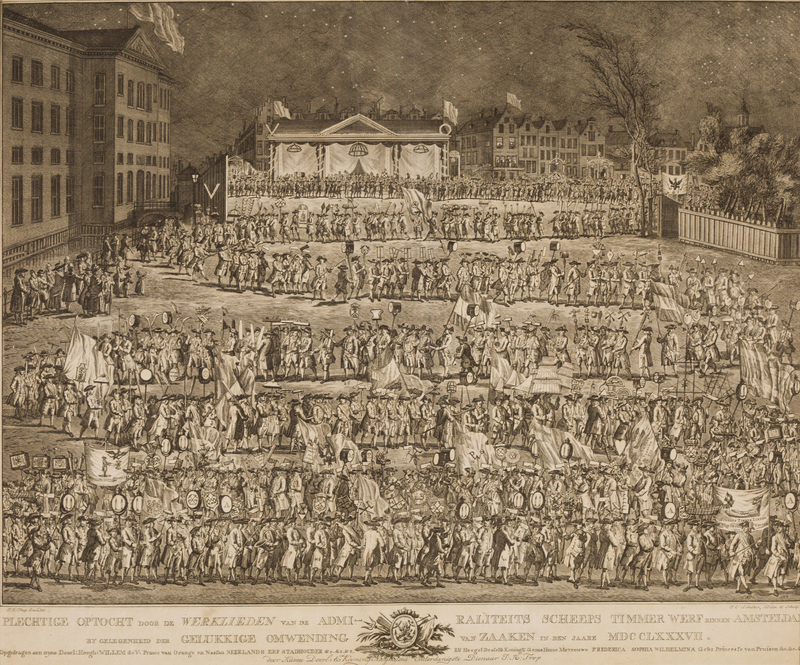 By Gelegentheid der Gelukkige Omwending van Zaaken in den Jaare 1787 [..]”. 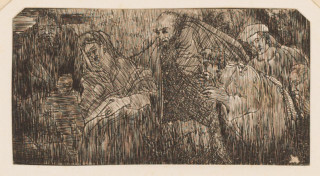 Large-sized engraving (in a contemp. handcolouring) with Dutch caption (incl. 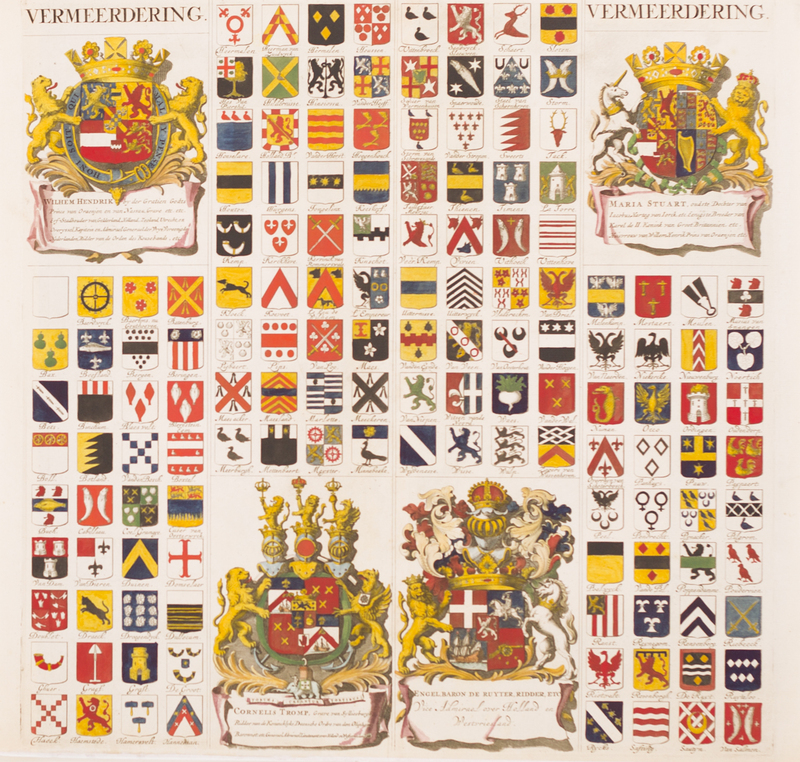 a coat-of-arms of “VOC A[msterdam]”). Publ. by J.H. Trop (Amsterdam, ca. 1787). Ca. 52 x 63 cm. Behind passepartout. [DELFT] – “DELFI BATAVORVM VERNACULE DELFT”. Handcol. engr. 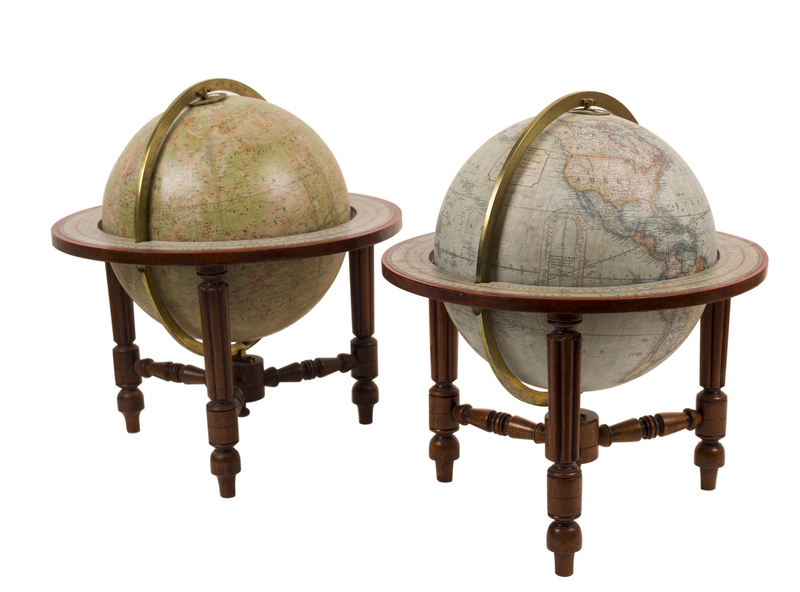 bird’s-eye plan with cartouche, legend (listing 37 items) & 2 coats-of-arms. (Publ. 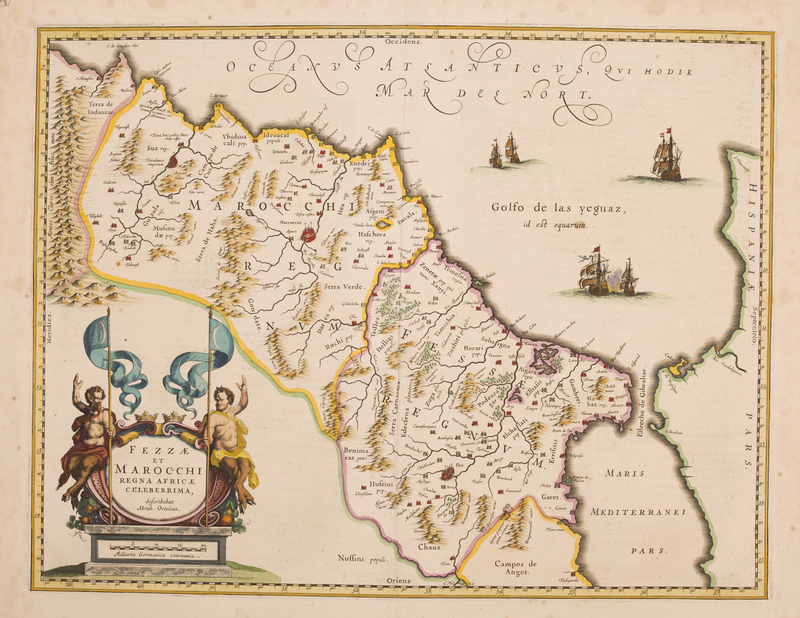 by J. Blaeu, ca. 1649). Ca. 37,5 x 49 cm.